• Wi-Fi Adapter: Connects the Wally to a mobile hot spot or available wireless data connection to stream videos or use apps like Netflix or Weather Channel. • Over-the-Air Tuner: Allows viewing of over-the-air local channels in the Wally program guide. • Wally RF Remote: Changes channels up to 200 feet away through walls and obstructions and can be located via the remote finder feature. • DVR Upgrade Expansion: Converts the Wally into a DVR for up to 100 hours of HD recording. • Bluetooth Adapter: Enables wireless audio connection to Bluetooth speaker and headphones. 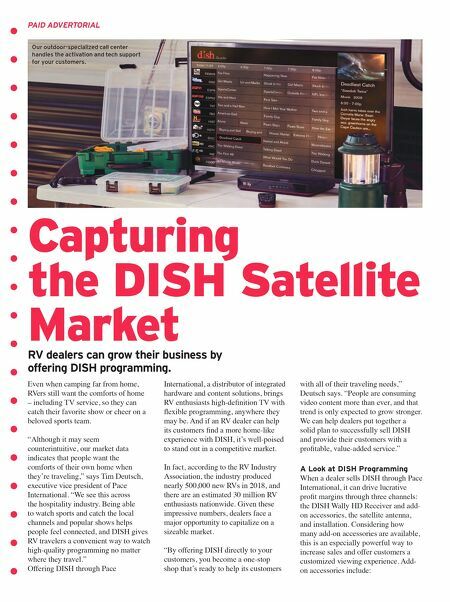 Even the Programming packages are customizable with DISH's Pay As You Go Programming, which allows the RV owner to pay only for the months he or she plans to use. Many RV owners are not on the road every month of the year, so paying for an annual contract isn't ideal. With Pay As You Go Programming from DISH, that sales barrier is no longer an issue for dealers. "We created this program in 2010 specifically for the RV market," Deutsch says. "This kind of program had never been done before. It's a fantastic program for an RV owner, and because it allows customers to only pay for the months they want to use the service, there are no contracts or credit checks. The Pay As You Go Programming option continues to grow every year and we feel it is poised for exponential growth." For customers who already have DISH at home, they can also keep costs low by adding a mobile receiver for only $7 a month. Dealers can still capitalize on this sale by offering satellite antennas for the RV as well as add-on accessories. 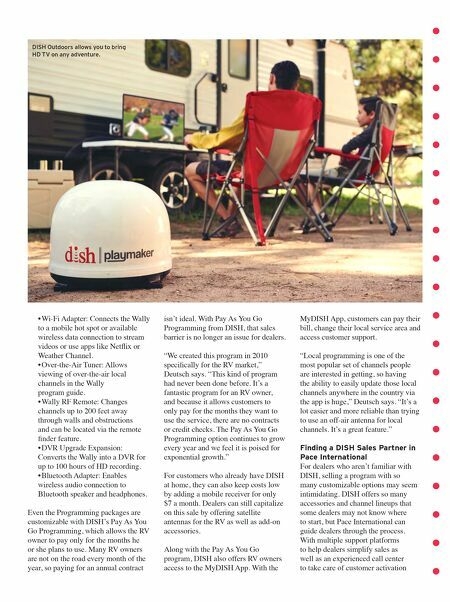 Along with the Pay As You Go program, DISH also offers RV owners access to the MyDISH App. With the MyDISH App, customers can pay their bill, change their local service area and access customer support. "Local programming is one of the most popular set of channels people are interested in getting, so having the ability to easily update those local channels anywhere in the country via the app is huge," Deutsch says. "It's a lot easier and more reliable than trying to use an off-air antenna for local channels. It's a great feature." Finding a DISH Sales Partner in Pace International For dealers who aren't familiar with DISH, selling a program with so many customizable options may seem intimidating. DISH offers so many accessories and channel lineups that some dealers may not know where to start, but Pace International can guide dealers through the process. With multiple support platforms to help dealers simplify sales as well as an experienced call center to take care of customer activation DISH Outdoors allows you to bring HD TV on any adventure.